Today, the demand of electricity is rapidly growing in this world and set to be doubled by 2030. So it is necessary to increase the supply of electric power and for that it is very essential to find other alternative methods to produce electric-energy. 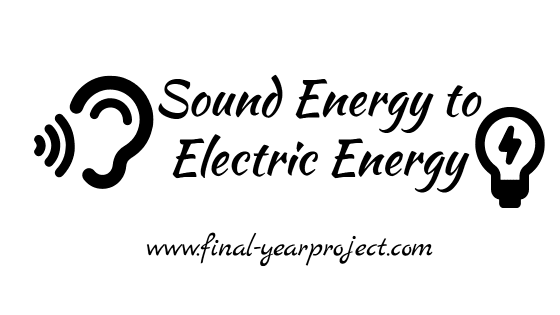 And this project on "Converting sound energy to electric energy" is to solve the energy crises. You can also Subscribe to FINAL YEAR PROJECT'S by Email for more such projects and seminar. When we think of another method to generate electricity and power, many methods strike to our mind like using wind energy, hydro energy, solar power etc. But what if we generate electricity from sound pollution? So is it possible to convert sound energy into electricity? Noise pollution is waste and no one want it and if this waste form of sound could be converted and used, then it will be very beneficial for mankind. Working of this project is based on the oscillation created by the sound wave which can be further converted to electricity and as the frequency is high the movement will be fast due to it we will get appreciable amount of electric energy. 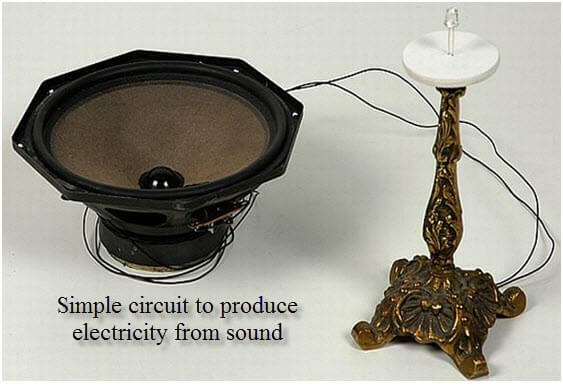 This project uses loudspeaker (transducer) to work opposite as of its normal working. i.e instead of converting electrical signal into sound it converts sound wave into electrical. The above diagram shows the prototype of the project. In this arrangement, as the high power sound is provided at diaphragm of the speaker it will produce electricity thus make the LED glow. Hope you will like this project and will try to implement it. Use this report for your reference and study work and if you like it, share with your friends.